15% Off Harvest Special – 4 Days Only! 15% Off – 4 Days Only! Harvest the savings from E3Live! 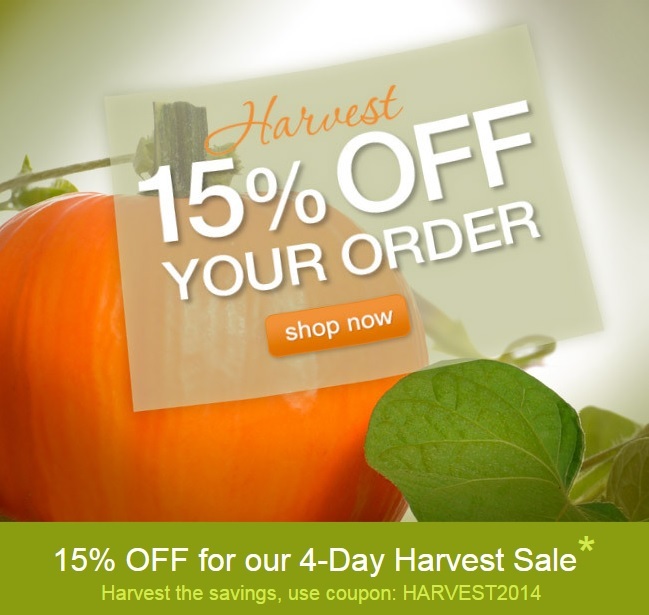 Save 15% on your order on www.e3live.com using coupon HARVEST2014. It’s our 4-Day harvest sale so you can stock your cupboards for the fall season. Offer ends Nov. 2nd at midnight PST. Enjoy! Feline nutrition is a very misunderstood topic that has led to health problems in millions of pets. Cats are obligate carnivores. Their nutritional needs are stricter than with a dog or other domestic pet. They must eat a meat based diet to not only thrive but simply stay alive. Cats have certain dietary nutritional needs that can only be met through consuming meat. Unfortunately since corn, soy and other fillers are cheaper than meat they are added into commercial cat foods to increase profit margins. The price is our cat’s health. Feeding a grain free kibble is a step in the right direction for improving the health of your animal. Since cats have a low thirst drive, feeding a wet food will help keep their bodies hydrated. Another option is raw feeding your cats. Like dog owners, cat owners are seeing dramatic results in raw fed pets. I know from personal experience that my barn cats are always extremely healthy. They are offered a small amount of grain free food but spend the majority of their day hunting mice and birds. Compared to my indoor kitty (who will not eat wet or raw food) they are much healthier. They are more active, their eyes are brighter and their coats shine beautifully. There are a variety of supplements you can include in your cat’s diet. Most of them are enzymes or probiotics. While there are hundreds of products for dogs, cats seem to lack the wide variety that you see for our canine friends. If you have a multiple pet household it is also nice to find a product you can feed to different ages and types of animals. E3 Feline is one of those products. It provides over 65 vitamins, minerals, amino acids and essential fatty acids. It provides nutrition to help with overall health and fill any missing nutrients in your pet’s diet. Adding extra nutrition can help to improve their skin and hair, provide more energy, and boost their immune system. E3 Feline is also a product that you can feed to your other pets! Sometimes it’s a challenge getting cats to eat new additions to their diet. The easiest way to offer something new to your cat is to mix it with wet food or a favorite treat. Start off with small amounts and increase over time. Many cats actually love the flavor of E3 Feline – it tastes like eating grass. Do you have a favorite tip or trick for introducing new food to your kitty? Let us know in the comments below! E3 Feline comes in Fresh-Frozen or convenient powder. Smokey Loves E3 Canine – E3Live Video Contest Winner! We had an E3Live Video Contest where we asked people to send us videos spotlighting their favorite E3Live products. Choosing a winner was difficult. And, we have to share the Grand Prize video with you – it features Smokey the incredibly smart pooch! Watch “Smokey’s Surprise” – and see how much Smokey LOVES E3 Canine! Here at E3Live, we recently conducted a study – asking people to have their dogs try E3 Canine for 30 days and offer us feedback. We invited dogs of all ages and sizes to participate and were very pleased with the success stories we received in return. The stories are so amazing we simply had to share them with you! We’ll be sharing the stories with you in this blog. Be looking for some amazing pictures and even some videos of our E3 Canine Success Stories! Chase is the first lucky pup we will be featuring on our blog. 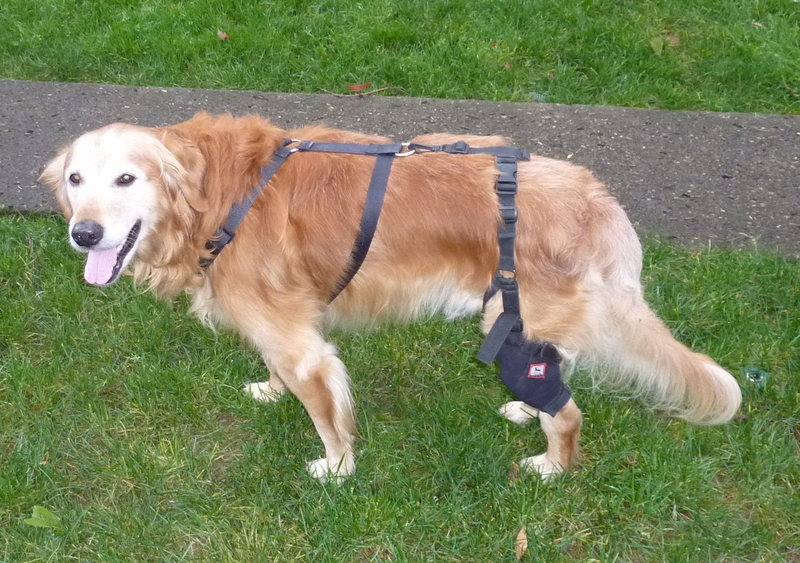 Chase is a nine year old golden retriever with arthritis from a torn tendon in his knee. Michael Wooley entered Chase as a candidate for the E3 Canine Study and we were excited to have them! 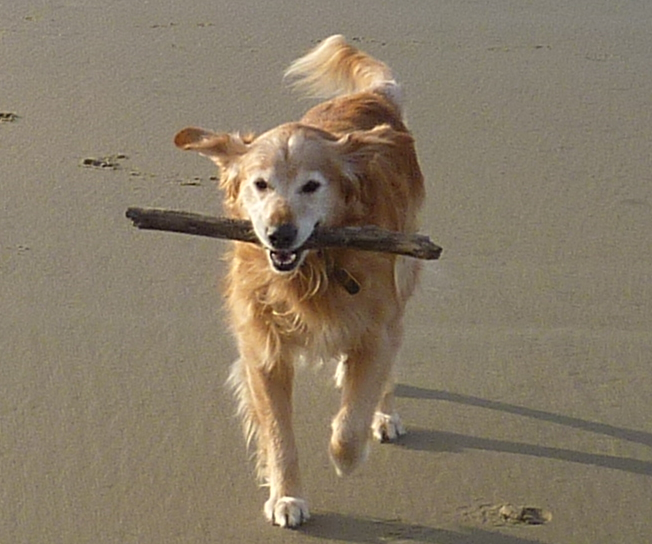 Does your dog have any specific health challenges? Michael: While running on the beach, he tore his left rear arterial ligament at about the age of 5 years old. No surgery was done as the vet said that those procedures don’t work that well. He advised us to let scar tissue grow back but Chase would have arthritis at some later stage. We started seeing it at age 8. After runs at the beach, he would limp and suffer for a day or two. We would give him low dose aspirin to take away some of his pain. He seemed sluggish with not much drive. What were you expecting E3 Canine to do for your dog? Michael: I was hoping it would give him more energy, and help him with his aches and pains. Did your dog like E3 Canine? How did you serve it to him? Michael: He loved it with cat food or sprinkled on scrambled eggs. What results did you see in your dog after using E3 Canine for 30 days? Michael: He has a lot more energy. After runs on the beach, his recoup time is much better. He doesn’t get up in pain after lying on his dog bed for an extended amount of time. He also seems to walk more upright with less bending/slouching through his body. Will you continue to use E3 Canine for your dog? Do you think E3 Canine would be a good product for your other pets? Would you recommend E3 Canine to other pet owners? After seeing your dog’s response, would you be interested in trying E3Live for yourself? Michael: Yes, we already use BrainON! Michael: It seems to be a great product with no bad effects. We started seeing improvement within two days of feeding E3 Canine to Chase. We love our puppy, Chase. He is the greatest part of our family, and we alwaystreat him as such. When he is in pain, we’re all in pain. We are so thankful that E3 Canine has been able to help him with his pain, as well as his energy levels. It is like he’s a puppy all over again! It’s nice to know that we are finally able to give Chase something to keep him happy, healthy, and playful. Chase After taking E3 Canine for 30 Days! Thank you Michael and Chase for participating and for your great feedback! Watch this video about Chase’s success with E3 Canine! While many people prefer to keep their kitties inside to live, there are plenty that live outside part or full time. Living inside is much safer and warmer for a cat but not always an option. We have one that has never stepped outside as well as a barn cat. While the barn cat isn’t as tame as our indoor one I’m still always concerned about her winter care. Here are some tips to keep in mind for the colder months. Shelter – An outdoor cat should have access to some type of insulated shelter. You can use a small dog house or use cardboard boxes. If you use boxes put a smaller one inside a larger one and fill the space between them with straw to help insulate. Make sure it is in a draft free and dry location. Cats get cold and need a warm place to sleep during long cold days and nights. 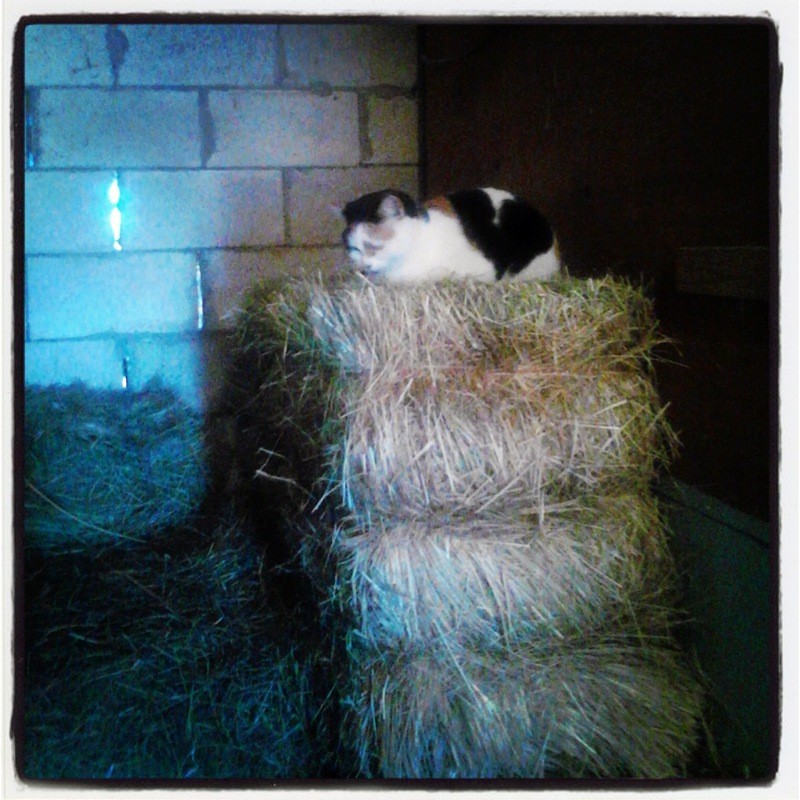 I find that my barn cat sleeps in the stacks of hay or straw. Water – Keeping water from freezing can be a challenge. Even in my barn the water freezes so I make sure to replace it twice a day for our kitty to drink from. Animals should not be forced to rely on eating snow for their source of water. Cats that hunt or eat food will need less water but it should always be available. Food – Cats need extra food in the winter to help stay warm. We feed outdoor cats all year (and yes they still hunt great!) but always increase it in the winter months. A lot of small critters they eat hibernate and aren’t out for as many hunting opportunities. My barn cat earns her keep hunting and keeping mice out of my grain but I never want her to lose weight during the cold months. Make sure they are fixed – Spaying and neutering is important! You don’t want to find a new batch of kittens in the spring (and fall) each year. Overpopulation is a huge problem so do your part. When my barn kitty came home she was completely feral. We were able to get her spayed through a TNR (trap neuter release) program for only five dollars. They notched her ears to mark that she was fixed and she’s been a happy kitty since then. 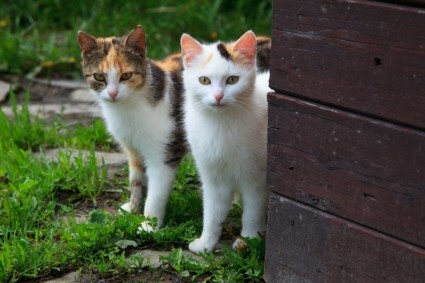 Worming – You should worm your outdoor cat twice a year at least. Heading into winter is a great time to do this. It will help them maintain weight and reduce parasite numbers where they live. You can use standard or natural wormers, the choice is yours, but it’s a critical part of your pet’s health. Do you have any tips for taking care of your outdoor animals during the winter? Dog and allergies is a common problem faced by pet owners all over the world. Two of the most common are food and flea allergies. They can be difficult to treat, especially naturally, but it can be done with some time and patience. Today’s dog foods are filled with ingredients that are not natural to a dog’s system. Grains, cooked meat byproducts, preservatives and artificial coloring are added to the foods to make them appealing and easy to use for owners. Unfortunately, they can have major impacts on your dog’s health. Along with disease and early death, food allergies have become a major issue. 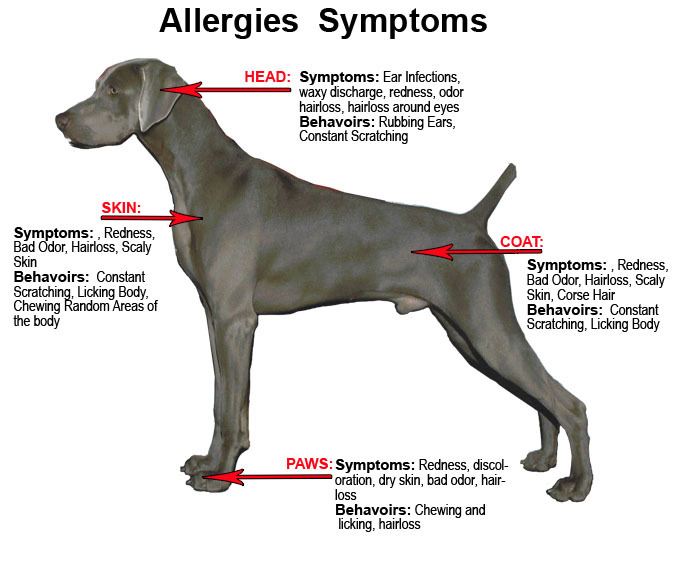 Allergy symptoms can vary widely for each animal. Digestive upsets are common as well as rough hair coat or hair loss and sneezing. Another major symptom is itchy skin. Some dogs scratch so severely they end up with bleeding sores on their body. They may also end up with sores on their feet from licking too much. These are often extremely effective either together or combined. I personally changed my dogs over to a raw food diet and provide enzymes and a high quality vitamin supplement. In fact, I use our E3Canine and Enzymes. I feel comfortable providing human grade supplements to my animals, as there is no worry about lesser quality. Flea allergies are also tough to deal with. Chemical flea treatments sometimes have severe or fatal reactions in animals. Cedar provides a great source of control for fleas and other insects. Combined with enzymes (to help the itching) it’s a great alternative. Obligate Carnivores. Do you know what that term means about your cat? 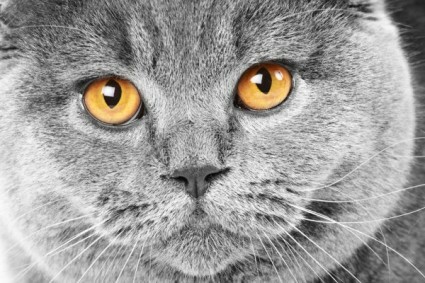 It means that your cat absolutely must have meat in their diet to live a long and healthy life. We are going to explore why cats must eat meat and why a grain free diet is much healthier for them. Evolution – Cats evolved as meat eaters. Since they were animals that ate only meat they lost the ability to make or use certain vitamins and minerals. Taurine is one you have likely heard of, and they are also unable to produce niacin. Arganine is another vital nutrient they get from meat. Cats aren’t able to produce vitamin A from beta-carotine like we can. Felines can’t live without these nutrients that are found in abundance in meat. That is why they are obligated to eat meat. Digestion – Cats have evolved a digestive system that is designed to handle raw meat. Their digestive system is very short. Raw meat digests very quickly and doesn’t need to ferment like carbohydrates do. Cats do very well on grain free or raw diets for this reason. They aren’t designed to utilize grains and vegetables in their diet. They have lost the ability to digest them. Carnivore vs. Obligate Carnivore – Many meat eating animals are classified as a carnivore, but some of them can handle and even thrive on a diet that isn’t meat based. A carnivore is an animal that eats a diet of mostly meat. They have sharp teeth and are designed to hunt other animals. An obligate carnivore is an animal that requires a diet of mostly meat. It is a necessity and is biologically necessary for survival. Bears are carnivores that have a diet containing a large amount of plants. Dogs can also to some degree digest plants and grains. Their digestive system is long enough to handle and process plants, grains and other non-meat items. Any bird of prey is an obligate carnivore. Dolphins, minks, and of course felines also fit into this category. Nutrition – Nutrition plays a vital role in your cat’s health. Many of the food options on the market are filled with grains and other fillers that cats are unable to process or use for nutrition in their body. How do you fill the gaps in their nutrition? A raw diet is a great way to improve health. Next best would be a commercial cat food that is grain free. Cat supplements are harder to find on the market compared to dogs or other animals. 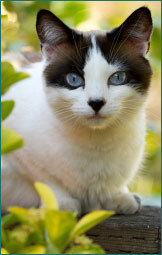 Our E3 Feline has extra nutrition for your cat and provides the necessary nutrients that may be lacking in their diet. I make sure some is on my cat’s food each day! How do you make sure your obligate carnivore is healthy?